It has been both rumored and anticipated that the new BlackBerry 8330 would feature the twin luxuries of GPS and Wi-Fi as standard. But, it seems according to some sources, that the 8330 Curve might not feature GPS after all. Whatever the outcome most companies are talking about months before anything is released so it may all change anyway. What the 8330 will be is a World Edition device and will be the third CDMA+GSM hybrid device from Research In Motion. It will join the 8830 and the as yet unreleased 8130 with this world-traveler functionality. Look of for this device to be showing up on the sites of Verizon, Telus and Sprint soon. CDMA providers such as Verizon and Sprint have customers who are clamoring for a full QWERTY keyboard BlackBerry that also features a camera -- the new 8330 will go someway to fulfilling that niche. However, if you are a GSM customer (AT&T, Rogers, T-Mobile or Vodaphone) you will likely not see a Curve with GPS anytime soon. If you're a CDMA customer (Verizon, Sprint/Nextel, Telus, Alltel, etc), you have a couple of options.-- get the 8830, which is available already, or wait for the 8130 Pearl (with a SureType-QWERTY) or the 8330 Curve with its full-QWERTY keyboard. 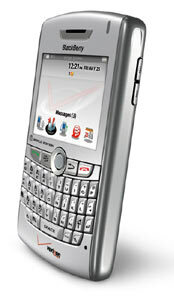 So you want a QWERTY devices with camera, GSM and Wi-Fi you need to pick an 8320. Or a Sure Type consumer friendly device with camera and CDMA you need to pick a 8130 Pearl.